With the Commission being told yesterday by some member countries that its proposals for abolishing Summer Time must be now delayed, Brexit Facts4EU.Org thought it appropriate to look at the question of time - EU time. has itself been put back. 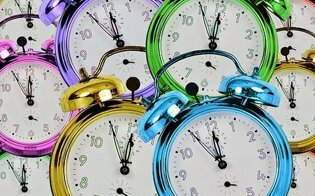 WHAT IS EU TIME AND WHY DOES IT MATTER? One of the best ways of describing EU time might be in the words of the Righteous Brothers : “Time… goes by… so slowly”. Sadly the song’s title ‘Unchained Melody’ hardly seems appropriate when talking about the EU. Unchained we are not - it doesn’t look like we will ever be, given that the Conservative MPs seem incapable of changing their leader. Nor does the idea of melodiousness cross most people’s minds when thinking about the EU. Perhaps ‘Chained Dischords’ might be better. WHAT HAS EU TIME GOT TO DO WITH BREXIT? Put simply the EU takes around four times longer than it should do to achieve anything useful, and then describes that achievement as having taken half as long as the facts actually show. There is no doubt that both the EU and the unelected Olly Robbins are working to produce some form of fudged document which both sides can promote, and which will be presented as a ‘trade understanding’, or some such description. This will be a political document and it will not be worth the paper it’s written on. It will not be what we – being mostly business people – would even describe as a HoTs paper. (‘Heads of Terms’ – a summary of the basic structure of the deal.) It will be a fudge. 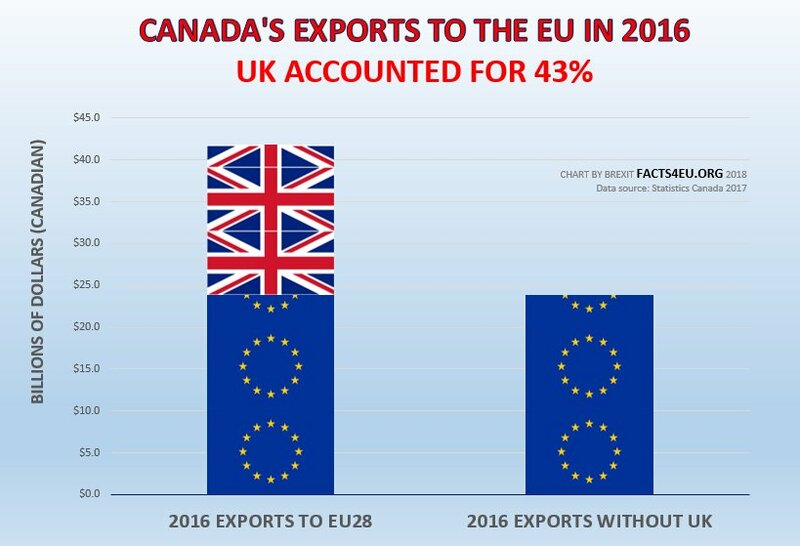 Let’s take the EU’s trade deal with Canada as an example. This has been much in the news as a possible template for a UK-EU trade deal. Indeed the ‘SuperCanada’ or ‘Canada+++’ concept has been taken up by many pro-Brexit MPs. We covered this idea in much detail, even interviewing its principal deviser and proponent, David Campbell Bannerman MEP. Below we look at the timelines for the EU’s original trade deal with Canada. HOW LONG DID THE EU-CANADA DEAL REALLY TAKE? The EU told everyone that the EU-Canada trade deal (CETA) took 7 years. No it didn’t. It started in 2004 in Ottowa. That’s 14 years ago. We have the documents, in case the EU Commission has misplaced them. HOW LOGICAL ARE THE EU? It would seem logical to try to do trade deals with the world’s largest economies, and to make these the key priorities. After all, if you compare just one deal with a country like the USA with a country like Canada, this would be worth ten times what the Canadian deal is worth. Unfortunately after more than 60 years of existence, the EEC/EU hasn’t managed to do a trade deal with the biggest and most powerful economy in the world. HOW REAL WAS THIS CANADIAN DEAL? The EU-Canada deal (CETA) isn't quite what it used to be. Or rather, it soon won't be. When the UK leaves the EU, this trade deal will not look as sweet to Canada. In 2016 Canadians sold goods worth $41,880 million to the EU. A great result. The problem is that a lot of that was actually sold to the UK. When the UK is no longer part of the EU, Canada's Free Trade Agreement with the EU will suddenly be worth a whole lot less. WHAT PRICE A UK-EU TRADE DEAL BY CHRISTMAS? 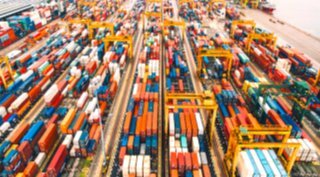 Brexit Facts4EU.Org has consistently argued that the EU would never do a trade agreement – even in principle – by the end of the Article 50 notice period on 29 March next year. The interesting thing about this quotation is that Mr Paterson was referring to LAST Christmas (2017), not this coming one. He and we were right then, and we’re right now. The UK should be preparing actively for an EU exit on WTO terms, and negotiating some side agreements on specific issues such as citizens’ rights, aviation, and other issues which need to be covered off to ensure life carries on normally. Unfortunately with the unelected Olly Robbins running Brexit policy, and Theresa May as Prime Minister, none of this will be possible. what about the EU’s budget? Latest EU expenditure figures from the EU’s Directorate-General for Budget headed by an unelected German, (Herr Günther Oettinger), show how the UK is treated. WHERE DID THE EU SPEND BRITISH MONEY LAST YEAR? WHO GOT THE MOST ‘EU MONEY’ LAST YEAR? closely followed by Poland and Germany. The UK – despite being the 2nd-largest economy in the EU - trailed in 7th place, behind little Belgium. Brexit Facts4EU.Org has brought readers a wide variety of research reports on different aspects of EU financing and the UK’s involvement in it. Today we have looked at just one measure – that of total EU expenditure in member countries last year (2017). The Chancellor Philip Hammond will rise to his feet in the Commons today to tell the country where he plans to spend its money. We thought that in advance of that you would be interested to see where the EU spent “its” money last year. In reality of course there is no “EU money”, only money given to it by its member countries. And the UK is one of only 9 countries putting in more than they get out, as readers know from our previous reports. 19 countries are net beneficiaries of the largesse of the British people. Yes, on this occasion we have shown only where the EU spent money from the EU budget of €137.4 billion last year. We have ignored all the ins and outs and looked only at the absolute EU expenditures per country. However, readers might perhaps find this interesting? If the EU spent its budget according to the size of each country’s economy then the UK would be in second place. As readers can see, instead of being in 2nd place the UK is back in 7th place, behind Belgium. Yet the UK’s economy is over 5 times larger than Belgium’s. The UK’s population is almost 6 times larger than Belgium’s. Readers may well ask themselves why more money from the EU budget is spent in France than in any other country. 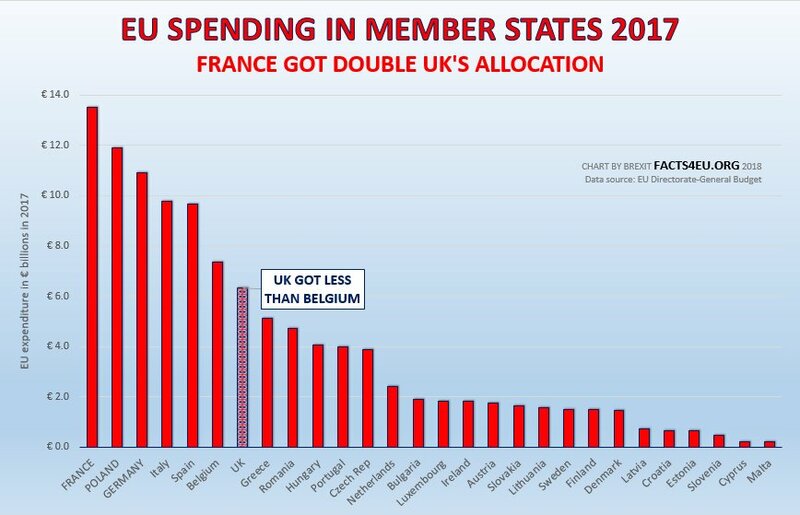 In fact France receives over twice as much of the EU’s budget than the UK. Yet the economies and populations are broadly similar. One aspect of the Referendum debate for which we produced an enormous amount of information and that simply never seemed to be covered except by us was the issue of wealth transference. We have never understood why the big campaign organisations didn’t make the simple point that for decades the EU has acted like a giant wealth transfer agency, taking money from the British and distributing it around the rest of the EU. It’s one thing talking about the UK’s enormous net contributions over the years, but we do not believe that the British public truly understand that they have allowed serious amounts of the country’s wealth to be transferred to the continent each year. POLISH ROADS FOR BRITISH PEOPLE? We’ve published numerous reports on the huge public infrastructure projects in places like Poland, part-funded in no small measure by the British people, but claimed as ‘EU projects’ by the Commission. Now if the British people consent to funding brand new Polish roads and railways when their own are in a state of disrepair that’s one thing. But we simply don’t believe that they know the extent of it. 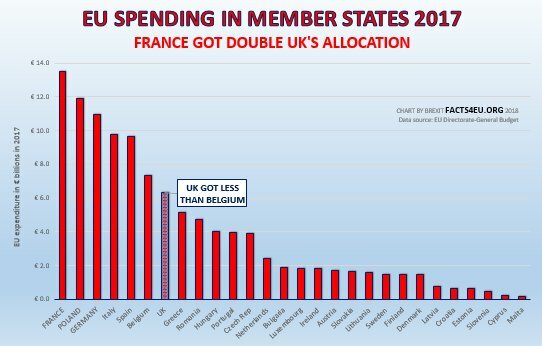 Perhaps our chart above, showing that even developed countries like France are receiving more than twice as much “EU expenditure” as the UK, might gain some resonance in the wider population. If you want to do something to help achieve Brexit there are many options open to you. May we suggest that a very effective way would be to make a donation today, so that we can cover the costs of reporting on facts like those above, and also spend just as much time getting them into the mainstream media and into MPs’ mailboxes? Message: Is there an overall figure for the amount of money the UK contributes to the EU budget? The much quoted figure of £8billion is only the upfront contribution, what about all the add ons for the EU army, EU immigration monies to Turkey, EU development funds, EU aid budgets money. None of these figures appear in the Budget Red Book published after every budget.I wonder why? Surely there is nothing to hide, after all it's our tax money and we should be told where it is spent. If the true cost of the EU to the British economy was revealed I am sure more people would question our membership of this totalitarian club. Reply: Yes, we have analysed the true costs many times. The new Brexit Index will be available later this week which means you'll be able to find information like this very quickly! Message: Well, well. Another signal that our Govt have no intention of leaving the EU per their mandate. 152 days until we 'leave' the EU and Hammond decides that there must be a budget. Err, why? What is it based on? Is it based on a clean exit from the EU on 29th March? No, as he says that he will have to 'think again' if we do. I could understand if it was, setting out the plans for our future as an independent nation again. So what IS it based on? Chequers? Is it just for 152 days? I suspect that it's a way of legalising payments to the EU as it has to be voted on in Parliament. Message: Your great research and facts needs to get into the mainstream media! Wouldn't it be the most effective way to silence still-Remainers? One of the media's most loved terms 'inspite-of-Brexit' could be turned back to them: Are you still happy to remain 'inspite of how the EU really works?'. They will soon run out of sensible reasoning (not that we saw a huge amount of that from them anyway). PS. I made a small donation to you this morning, please keep going! On Wednesday last week the President of the European Court of Auditors (ECA) addressed the EU Parliament in Strasbourg. The ECA had issued what is known as a ‘qualified’ annual report on the EU’s accounts for 2017. The ECA is an agency of the EU. Every year it audits the EU’s accounts. For decades the EU’s accounts could not get a clean bill of health. In 2007 the ECA finally gave them this assessment and and the ECA has given it again this year. However the EU’s revenue predominantly comes from the member countries such as the UK, so that is not what most people would look at. It is how that money is disbursed that might give EU citizens more cause for concern. It’s this second statement which is problematic for the EU Commission. ‘Qualifying’ their opinion means the EU’s auditors are not happy with the area of payments. The problem lies in approximately 47% of EU spending, which involves the EU making payments described as ‘reimbursements’ to countless organisations which spend money on the EU’s behalf. Perhaps one of the most troubling aspects of the report is the area looking at the EU’s spending commitments, compared to what it has paid out. So, the EU has built up over €¼ trillion euros worth of debt – plans and commitments it has made which haven’t yet been paid for. There are three main points we would make. 1. Did the EU fail the audit of its accounts? No. 2. Did it pass without any ‘qualifications’ (concerns)? No it did not. It is the third point we will focus on here. 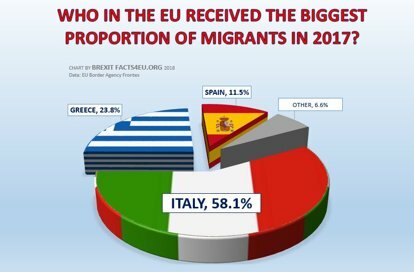 Brexit Facts4EU.Org has repeatedly drawn attention to this issue since 2016, and now the EU’s own auditors are highlighting it. WHY DIDN’T THE EU CUT BACK? Following the Brexit vote the EU could have started looking at its spending plans and started cutting back. This would be like a family deciding not to order new things if one of the family’s two top earners heard he or she was going to be made redundant. Most families would be prudent in these circumstances. Instead the EU has kept ploughing on like there’s no tomorrow, in the full expectation they could persuade Theresa May to pay for it with British money. The Prime Minister could have told the EU to start cutting back, but she didn’t. To our knowledge not one single EU spending proposal has been pushed back on by this government. Quite the reverse: we have only seen the UK government acquiesce meekly to EU proposals of all kinds in the vain hope of currying favour with the EU hierarchy. We pointed out how little of the EU’s budget had actually been allocated to specific projects. There was plenty of time for the EU’s plans to be revised. Instead the EU has pretended that all this money was ‘committed’ when it fact it wasn’t. We now know from the EU’s own auditors that the total sum of outstanding 'commitments' involved is €267.3 billion, as at 31 December 2017. We also know from our own research that a significant part of this amount still hasn’t been allocated to projects. The UK has no legal obligation to pay any Brexit Bill, as we have reported on numerous times when covering legal opinions, including from the Europhiles in the House of Lords Committee. Even if the UK is prepared to pay a vast sum – which must only be on an ‘ex-gratia’ basis – then at the very least it should have told the EU in no uncertain terms to rein in its profligate spending plans. If Theresa May isn't stopped, this country is headed for the worst and most expensive treaty in the history of international relations. 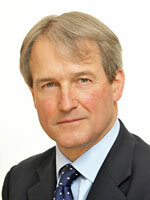 Message: UK Member's Of Parliament - WAKE UP TO WHOM YOU SERVE WHY DON'T YOU? The UK electorate elected MPs into the House of Commons, funded by taxpayers with their expenses paid. In the main, most of the electorate appreciate the work of MPs, and if we do not they lose their Westminster seat. We DID NOT elect them to serve or be dictated to in any manner howsoever by the unelected EU Commission. This 'attacks' UK democracy itself. Let this be clear to ALL UK MPs, we had a democratic vote, "Leave the European Union" won, remain did not, and we expect delivery on 29th March, 2019 - END OF. If the above Facts4EU article, and all those before it do not work their way into the brain cells of those we elect, then in my opinion Member's of Parliament who obstruct the outcome do NOT deserve to be respected (save those 'fighting' hard to uphold our vote). MPs and peers are supposed to be pillars of our country, yet they fight against a democratic vote. As above, the President of the European Court of Auditors addressed the EU Parliament on Wednesday, 17th October, 2018. The timing of this is interesting because the UK Chancellor [2nd Lord of The Treasury] will shortly present his latest budget to Parliament. Prime Minister May is 1st Lord of the Treasury and will have signed it off? There is much anger in our country because some MPs refuse to accept a democratic outcome, and I hold those MPs in absolute contempt. I now take the view our country is being held back by those elected MPs who are not prepared to stand up and remove Prime Minister May from power and replace her with a Brexiteer MP. Barnier et al, are taking our great country for granted. They treat us like fools because they're upset the UK majority VOTED TO EXIT. They want to 'bleed' our country dry whilst there are many having to use food banks - and the UK is the 5th or 6th largest economy on the planet. Our Prime Minister appeases the EU like never before and wishes to give away £billions to it. One only needs to view how much Mrs May has given away post referendum to be concerned, and the £billions she proposes to give away to the EU. I have reached my final decision that Prime Minister May MUST be replaced, and I will NEVER vote Conservative whilst she remains in office (nor will I vote Labour who also have 'difficulty' with democracy). Message: As usual it's that lack of accountability that makes Eurosceptics like me mad. And most likely the EU gravy train will be a major absorbing sponge of that 1/4 trillion pound debt. Message: No wonder the EU is desperate for money from the UK. €267 billion is a lot even for the Eu's extravagant attitude (with others' money). The 'Goodbye Bill' or whatever they want to call it is yet to grow, in my opinion. Where else can the EU patch this up from? Message: The reason that there has been no cutback by the EU is because they believe they can reverse the Brexit mandate of the British people. By putting obstacles in the way of our Remainer politicians together with project fear they believe that the UK Government will cave in and rejoin the EU "project". The EUs biggest fear is that the UK, strategically placed off their borders would be serious competition to their markets, the UK could offer lower corporate taxes and less red tape. 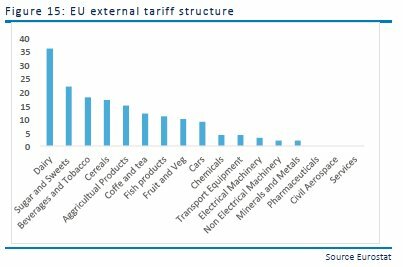 Serious competition to the high regulation, high external tariff EU project. What if the EU just tore it up? On Monday the Chancellor the Rt Hon Philip Hammond MP will deliver his last budget before the notional date of the UK’s departure from the EU. MPs will have a chance to debate the budget and to vote on it. The result of the vote will count. The EU has just removed this option for Italian MPs. REQUIRED READING FOR REMAINER MPs? On Wednesday we brought you the news that the EU has moved against Italy, demanding it changes its economic policy and re-writes its budget within 3 weeks - or else. Do Remainer MPs really want to be this powerless? The article below contain reactions and background to the latest imposition of EU rule over Italy. On Wednesday we reported on the EU’s instruction to the Italian government to re-write its budget for next year. Today we bring you some reaction and background, which helps to bring a bright, shining, Brexit light on the effect of the EU on national politics and on the peoples of the EU countries. “They have sanctioned us thousands of times. They have massacred our agriculture, our fishing, our commerce. But France and Germany haven’t respected the EU parameters for years. “If there is a rule that tells you that on Wednesdays you wear white, on Wednesdays you wear white. 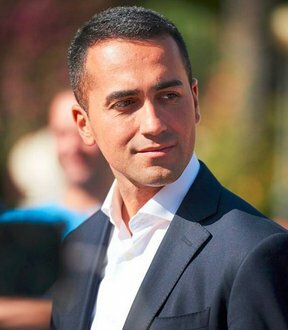 In March the Italians went to the polls to elect a new government. The result was a disaster for the EU. The result of this election came about in part as a reaction to what Italians see as the EU’s impact on Italy’s economy over the last couple of decades. In order for a country to join the Euro, the limit on government debt as a percentage of GDP is technically 60%. 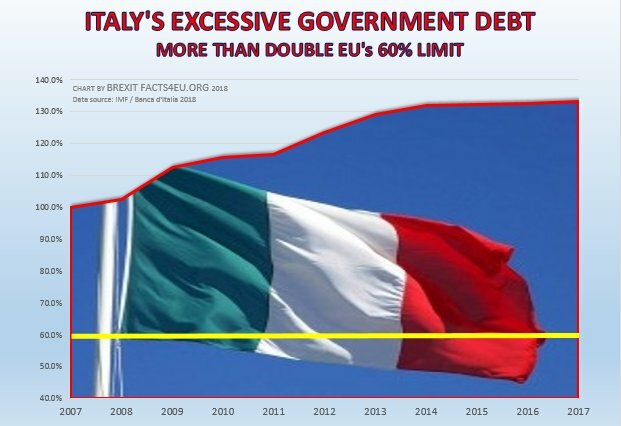 Today, according to the Banca d’Italia, the Italian government’s debt stands at 131% - more than double the limit. 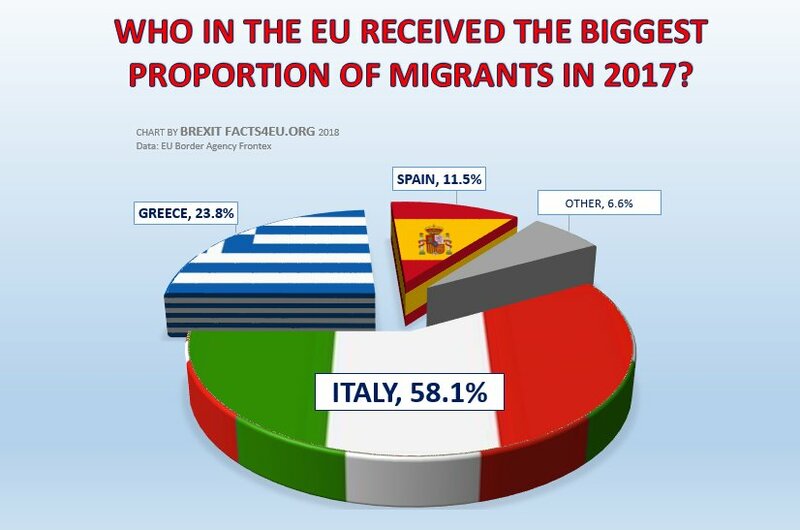 Italy has had to cope with massive immigration, caused by Angela Merkel’s unilateral decision in 2015 to break EU rules and open Germany’s doors, resulting in over 2 million migrants entering the EU. Despite the EU’s constant proclamations that the migrant crisis is over, it doesn’t feel like that to many Italians. 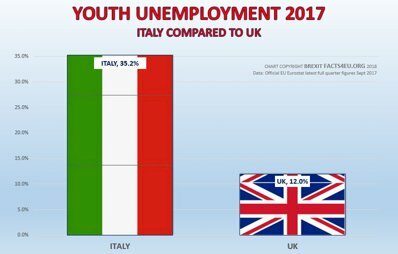 Meanwhile the youth of Italy has taken a major blow, lasting a generation. 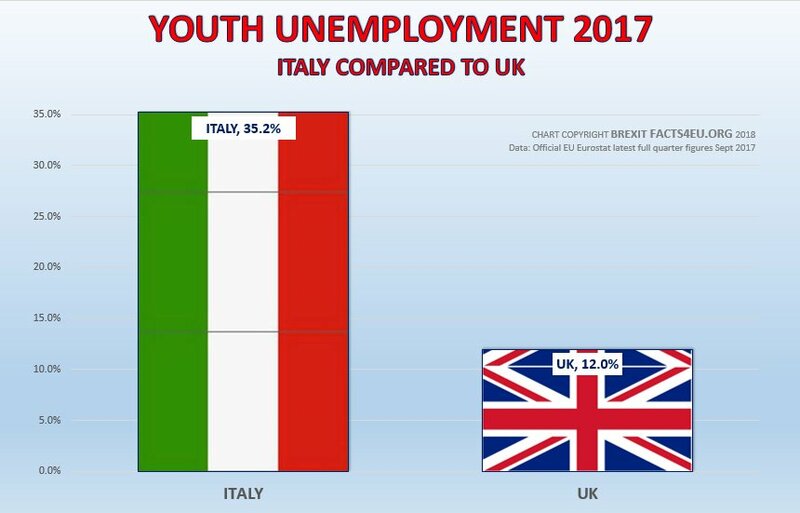 When we last produced a chart on this in March, youth unemployment in Italy stood at over 35%, despite many young Italians not even appearing in these figures, as they had already departed to get jobs in countries such as the UK. Early Wednesday morning we published the story of how the EU is once again in turmoil, and has started taking further dictatorial action against member countries – in particular Italy. We were pleased to see the mainstream media taking this up later. On Tuesday Italy had been told by the EU that it can’t run its own economy. It must go back to the drawing board and produce a budget acceptable to the EU Commission. See our article. Four days previously the unelected EU Commission had used the unelected ECJ (Court of Justice of the EU) to instruct Poland to tear up one the laws passed by its democratically-elected parliament. Not only that, but the tearing up of this law is to be retrospective. You can read that article here. DOES THERESA KNOW WHAT'S GOING ON? While all of this is going on, we must seriously question whether the Prime Minister really understands what's going on within the EU. If she does, she is most definitely not using it to the UK's advantage. There are major schisms which continue to develop. Each time they do, the PM appears to side with Brussels, possibly in some vain attempt to curry favour. She has shown no solidarity with any EU country which finds itself in conflict with the unelected Brussels hierarchy, and no inclination to forge alliances which might be useful in whatever the final Brexit outcome might be. Several countries are now the subject of serious action by the EU Commission over their refusal to accept quotas of migrants, and over other laws and policies of those national governments. Hungary in particular has been in the firing line. What all these countries have in common is that their peoples voted in national elections for governments that reject the globalist, no-borders, one-superstate EU. Instead, these people prefer to manage their own affairs. The EU refers to this as being the influence of “populist forces”. Message: Perhaps Mr Juncker or any appointed individual of the EU Commission would care to explain to everyone WHY Germany has not been fined for breaking EU rules. For the life of me, I do not understand why Mrs Merkel is still in power? Her unilateral 'all welcome' caused unseen consequences for other countries, and to Germany itself. Italy and some other EU member countries are doing the right thing by standing up for their own national interests and rebelling against the EU, whatever it takes (and my respect for those countries who are). Message: I agree with Salvini that the EU laws are constantly misused and twisted by the EU itself according to how it suits them best at any time. I personally think that member states might as well do the same, as they seem to be getting into trouble regardless of actually following or breaking EU laws. 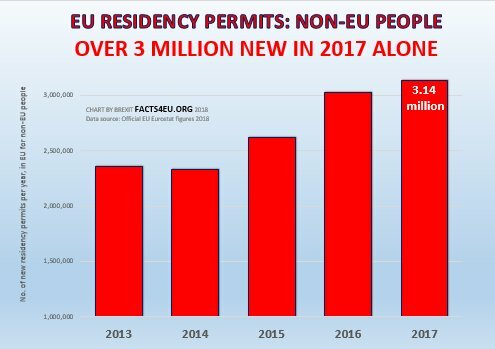 Latest figures released by the EU yesterday show that over 25 million non-EU people were granted new residence permits in the last 10 years. The number for last year alone was over 3.1 million. The numbers have been growing rapidly. Below is what has happened in just the last 5 years. A new residence permit is defined by the EU as any authorisation which is valid for 3 months or more issued by an EU Member State, allowing a non-EU national to stay legally on its territory. Note that this does not include repeat permits, and shows only the number of new residence permits. In other words these are almost all new people. Please also note that these figures only relate to newly-issued residency permits. We have reported separately many times on other measures, such as asylum applications, etc. The reasons for authorising residence for new residency permits include family reunification, education, employment, and ‘other’. The UK was the top country for education, Germany was the top country for ‘other’. 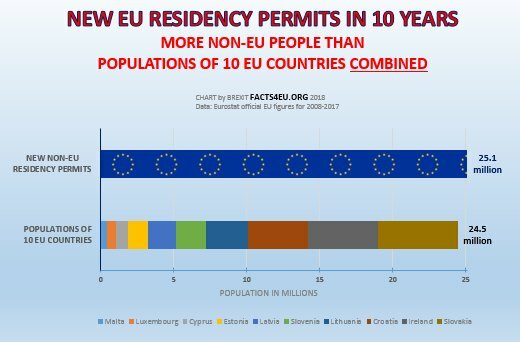 For the purposes of the analysis below, Brexit Facts4EU.Org stripped out the residence permits which were authorised for temporary study purposes. The most interesting fact is probably that Ukrainians gained by far the largest number of residency permits, at a staggering 638,740 in 2017 alone, excluding permits for study reasons. This was almost 25% of the total for all nationalities. The second place nationality – Syrians – only accounted for 8.5% of the total. Our further investigations revealed that there is essentially one country responsible for the huge number of new residency permits issued to Ukrainians in 2017. That country is Poland – the biggest recipeint of EU funds in the EU28. Almost 89% of Ukrainians who were issued new residency permits in the EU in 2017 went to Poland. HOW DOES THE UK RANK? The United Kingdom was the top country in the EU for education-related reasons (179,633 permits), according to the EU. Stripping out temporary study permits, the UK came third overall, after Poland and Germany. However this needs to be put into the context of the size of each country’s population. Per head of population, the UK doesn’t appear in the top 10 if study permits are excluded. 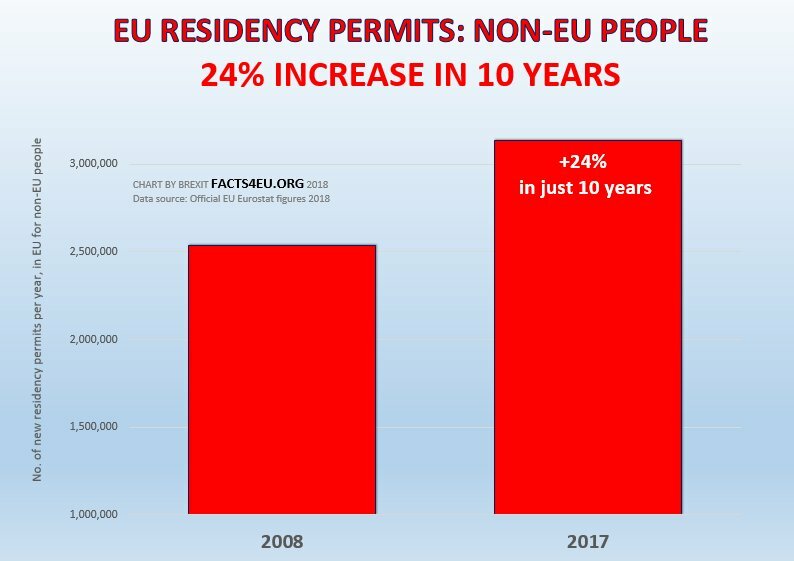 10 years ago, the numbers were significant, with 2.5 million permits being issued to non-EU nationals. Last year this had jumped by a highly-significant 23.7% to 3.1 million. This is despite the attention that has been brought to bear on the whole question of population change. The EU has been forced to address this because of the popular revolt taking place across the continent. However at the latest EU summit which Theresa May attended in Brussels last week the EU was once again unable to reach any agreement on its immigration policies. Over 25 million new residency permits issued in the EU in 10 years. That’s a lot of people. As we’ve shown above it’s equivalent to the combined populations of 10 EU countries. 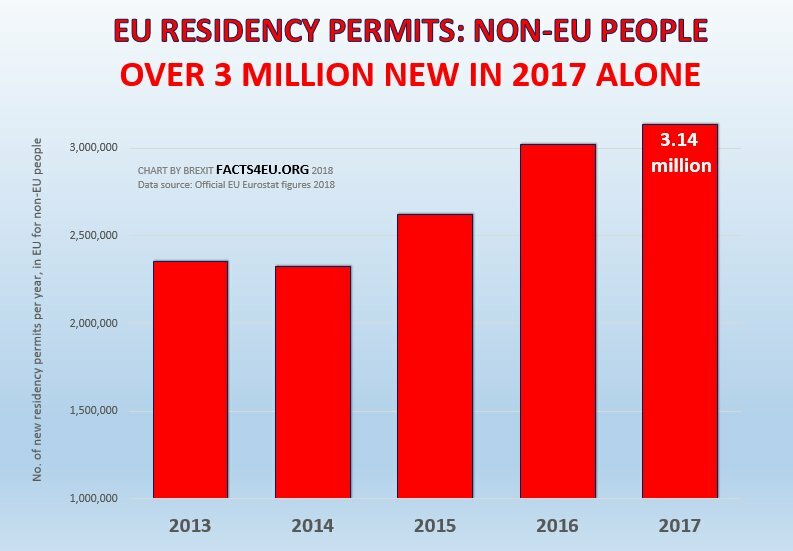 Naturally readers will understand that many residency permits are supposedly temporary, nevertheless over 3.1 million were issued last year alone. And of course these only represent the entrants who have used official channels and have applied for permits. As for those who are resident but have never applied for permits and who are ‘below the radar’, and those who applied once and then ‘disappeared’, we can only guess. In reading the above article it’s important to remember one thing. 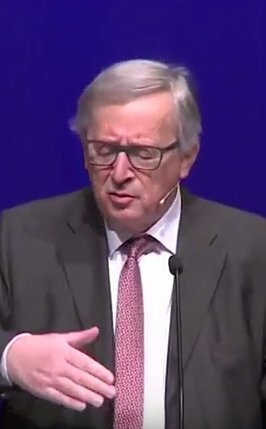 President Juncker doesn’t believe in borders, in common with so many in the EU and the global Establishment. And no, this isn’t the kind of wild rhetoric you get from Remainers, it’s fact. We do our research, because we think facts are important. Here is what EU Commission President Juncker said in 2016 in a speech he made in Austria. We found this to be yet another extraordinary anti-democracy statement from a top EU (unelected) politician and published an article on it at the time. Message: The truth is that borders between free democratic sovereign nations who then agree to trade freely with each other is more peaceful, more secure and better economically than anything the EU will ever achieve. "Who can believe such a thing?" 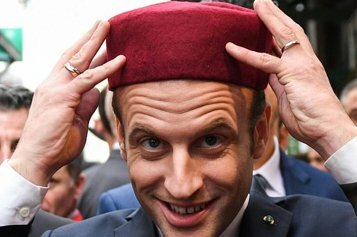 Brexit Secretary Dominic Raab had suggested that in the worst case scenario, French disruption could lead to problems. But Bertrand, who is Regional President for Hauts-De-France was gobsmacked and responded to the reports by tweeting: "No! Closing the port or the tunnel of Calais to the British in case of Brexit without agreement is not envisaged! Who can believe such a thing? We must do everything to ensure fluidity. The Hauts-de-France area and Calais are planning to Implement a fast pass to improve fluidity at both ports & tunnel. Who on earth could think that a go-slow approach would be good for business?" Bertrand also tweeted a photo of him with the British Transport Minister Chris Grayling, making clear that he had been working with Calais Mayor Natacha Bouchart and local economic players to ensure the smooth flow of both sides of the Channel. Disruption following a No Deal Brexit is not in the interests of business in the UK or the EU. Yesterday the meeting of the 1922 Committee turned out to be another non-event. Billed as a ‘showdown’, the packed meeting to grill the Prime Minister was little more than a ‘show-up’, by all accounts. Readers will no doubt see the various comments made by MPs on either side of the Brexit debate following the meeting. Mrs May once again seems to have survived, despite her Brexit policy being a complete embarrassment and despite the country heading for an outcome far worse than the United Kingdom’s current membership of the European Union. Are all these MPs who were supposed to be trying to remove her in fact ‘Brex-Frit’? Troublemakers who wish to honour the manifesto by which they were elected. Message: Sky news presenter Adam Boulton called Brexitier MPs troublemakers twice within a few sentences whilst talking about the 1922 Committee meeting. Interesting, nevertheless quite widespread delusion that it is actually the people who were for Brexit and won the referendum - therefore expecting it to be delivered - who are the 'troublemakers' and not the Remainers who are trying to sabotage this in every possible way - sometimes bizarre ways - they can think of. Viewers of Prime Minister’s Questions (PMQs) in Parliament yesterday would barely have noticed that something called Brexit is about to ruin the country thanks to the inept leadership by Mrs May. “There have been reports today that the Government is willing to agree that the European Court of Justice would be the final arbiter in most cases arising from Brexit. “I haven't seen those particular reports … but if they are as he has suggested then they are wrong. How is it possible for MPs – and for Jeremy Corbyn – not to savage the Prime Minister during her 45-minute questioning each week? Readers who are adroit in May-Speak will have noticed that the Prime Minister did not ‘authoritatively deny’ the claim that EU courts will continue to rule over the UK. She merely pushed it down the road by saying that “in the future” the ECJ will have no jurisdiction. Well to this we would reply: “in the future Rodney, the Brexit Facts4EU.Org team are all going to be millionaires”. We fail to understand why week after week MPs do not tie the PM down to specific dates when asking their questions. Notes for our international readers: The reference to ‘Rodney’ comes from a famous scene in one of the UK’s best-loved comedy series: ‘Only Fools & Horses’. International readers should also know that at PMQs there is no opportunity for a follow-up question. "Fear not to kill the king, 'tis good he die", or "Kill not the king, 'tis good to fear the worst." As history repeats itself these MPs at the moment only seem to care about positioning themselves in a way that they're safe if either TM stays or falls. The most definitive source of Brexit facts will soon be at your fingertips. Work should be completed within days and you will then be able to access hard information on any aspect of Brexit in just a few clicks. APPEAL - WILL YOU BE A SPONSOR FOR JUST £10? The Brexit Index is comprehensive, easy-to-use, and there’s nothing like it out there. It has taken 4 months to produce and is based on the last 18 months of our work. If you can help us to cover the enormous cost, please use one of our payment methods below. Choose the level of donation you wish to make (£10 gives you standard access for 4 months, £50 gives you 'Pro' access to far more) and tell us that you’re sponsoring the Brexit Index. We’ll then confirm back to you. Please use either of the 'quick one-off' methods below, ignore the description, and simply choose the amount. We will be announcing the full launch of the Brexit Index here very shortly. Please do something to help us, if you can. Following the latest EU summit, Theresa May ‘emerged’ to tell reporters that “a plan has ‘emerged’” to extend the Transition Period into year two of the next decade. We suggest that it was her clear intention to give the impression that the idea had come from the EU. 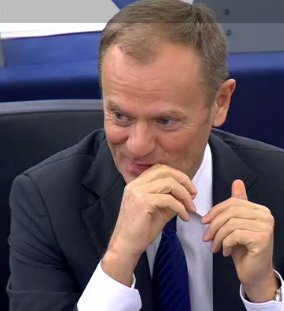 Yesterday in the EU Parliament the unelected President of the EU Council, Donald Tusk, exploded that notion. The Prime Minister wanted the British people to believe the extension of the 'Transition Period' wasn’t her idea. Well, we think there is some truth in that. The idea probably ‘emerged’ from the real Brexit Secretary, the unelected civil servant Olly Robbins. Mrs May nonetheless wanted the British people to believe that the idea of extending their vassalhood to the end of 2021 (and most inevitably beyond) came from the EU. Sadly Mr Tusk's statement to the EU Parliament yesterday proves this to be yet another lie from the Prime Minister. In the words of Theresa May, "Let's be clear". The current Prime Minister has none of the basic requirements to lead this country through Brexit. She knows almost nothing about the EU. She looks like she can't even find a room in Brussels, let alone owning it if she gets there. Her lack of knowledge and decision-making ability has even meant that she had to give the job of negotiating Brexit to the unelected civil servants in her 'Europe Unit'. And look where that has 'led' us. If none of you have what it takes to challenge her we will end up not leaving the EU in any meaningful sense whatsoever. Whilst that will delight some of you, those who have some vague understanding of the feelings in the country outside Westminster will know that you face the possibility of electoral oblivion - regardless of the alternative. Message: Just like with cars, with leaders too there comes a point when replacing them makes much more sense then trying to patch up all the faults to make them more or less functional. Yes, I think we agree, there's no question about the economy of replacement. Message: Dear MPs, In the 2017 GE, I had a binary choice: vote Conservative, or vote Labour. 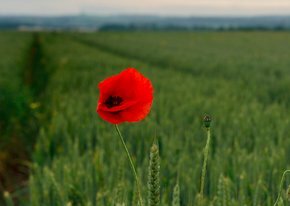 I did not have the choice to vote for a party that represented all the political views in the country; neither a Conlab, nor a Labcon exist. Yet my binary choice in the referendum (Leave) is being framed as a Brexit to suit everyone. A vote to remain in part or whole in the EU means you are happy for EU laws to take precedence over UK laws. If you have no 'meaningful vote' your job has no meaning and our democracy has no meaning. Time to choose: you, and your constituents decide how we lead our lives, or leave it to the unelected and accountable. While most Brexit minds yesterday were looking ahead to this afternoon’s appearance by Mrs May in front of the 1922 Committee of Conservative backbench MPs, the EU once again flexed its muscles in Brussels. 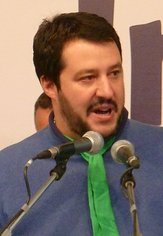 The EU invoked a new power over a member country for the first time, provoking a strong reaction from the government of the country in question - Italy. Yesterday, just 4 days after the unelected EU Commission used the ECJ to reverse one of the laws of the elected Eurosceptic Polish government, the Commission turned another Eurosceptic member country into a ‘vassal state’. 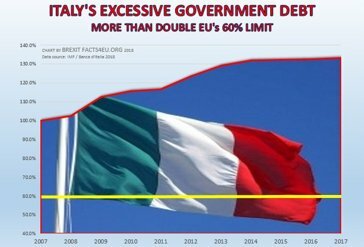 This time the vassal state is Italy – the 3rd-largest economy in the EU after the UK departs. In 2013 Brussels won new powers to dictate the economic policies of member countries in the Eurozone. The new Regulations forced national governments to submit their annual budgets to the EU Commission before they were presented to their own parliaments. The Regulations enable the EU to reject a country’s entire economic policies and plans, and to force it to change these within 3 weeks - or face the consequences. This new power had never been invoked.... until yesterday. Whilst the EU Commission’s instruction to the populist Italian government is couched in diplomatic terms as a ‘request’, it is in effect an instruction based on a formal ‘Opinion’ from the EU Commission. There are perhaps two fundamental observations to make regarding the EU’s actions against Italy yesterday. The Regulations used by the unelected EU Commission yesterday were created between 2011-2013. They weren’t used until yesterday. The EU has been quietly accumulating power for itself for decades. Little by little these powers are now being used. 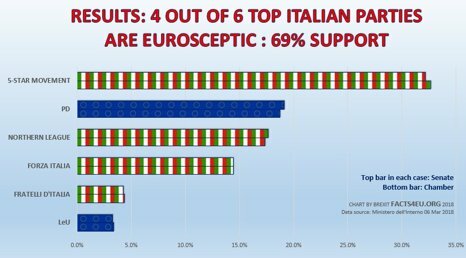 Today many Italians will be waking up to find that the EU doesn’t care about the major changes they voted for in March. It isn’t only Italy. On Friday when the EU moved against Poland, we wonder how many Poles knew that the EU could reverse laws passed by their own parliament, and do so retrospectively? In both these cases we suggest the questions are not about the details of Italy’s and Poland’s democratically-chosen policies which the EU is moving to overturn, but about the fundamental question of national sovereignty. Are you sure you want to continue submitting to ever-growing EU rule? Wouldn’t you prefer to have ‘meaningful votes’ on issues affecting the United Kingdom? And not have them overturned by Brussels? Prime Minister May has acted for over two years like a woman who wants to please the EU hierarchy. She hasn’t made regular visits to Eurosceptic countries such as Italy, Poland, Hungary and others. She hasn’t given support to any of the governments there. Frankly it’s astonishing that some of these countries have backed the UK. In an article later today or tomorrow we will show some concrete examples of this. Note (1) : For readers who are not familiar with the reference, our title today comes from a jokey song which reached No.1 in the British pop charts in 1981. Here's the YouTube link, if you can face it! Message: The visibility of the EU treating member countries as vassal states is emerging. It looks most likely that the UK will be a rule taker but tied to the EU for many years. Poland, but more widely the Visegrad Countries (4 countries), are well on the road to being deprived of their voting rights. Now Italy has 'misbehaved'. Austria already showed signs that are undesiring of the EU federalism so they might find themselves on the EU naughty bench too. Then there are several tiny or economically weak countries, so from the EU's point of view those votes can be bought easily or a little slap should sort them out. At this rate soon there won't be many countries left who can technically actually can vote on anything. We're desperate for more financial support. Can you help to keep us going? UNFORTUNATELY THIS REPRESENTS A QUARTER OF WHAT WE NEED TO SURVIVE. CAN YOU HELP? Yesterday the Prime Minister effectively confirmed her plan to keep the UK in the EU for five-and-a-half years after the British people had voted to leave it. The PM confirmed to the House of Commons that a plan has “emerged” to keep the UK tied into full subservience to the EU after 31 December 2020, which was previously the agreed end of the Transition Period. Mrs May stubbornly and wholly incorrectly refers to the ‘Transition Period’ as the ‘Implementation Period’. It is not an implementation period, as there will be no detailed agreement to implement. Instead it will consist of continued negotiations. Below are some excerpts from yesterday’s exchanges in the House. Anyone with any knowledge whatsoever of how the EU works will know that it is inconceivable for the EU to agree any extension which does not come in one calendar year periods. Mrs May has very little knowledge of the EU but she will at least know this. The reason is simple: the EU works in calendar years and its budgets are far too complex to deal with part-year adjustments. Even if it were to agree in theory, in practice the EU would simply front-load its expenditure commitments and in effect require the UK to pay for the full year. Anyone who has followed the constant capitulations of Mrs May to the EU since she came to power will know that there hasn’t been one idea that has “emerged” that she hasn’t then incorporated into her sell-out Remain version of leaving the EU. Yesterday Mrs May referred to the extension to the ‘Transition Period’ dozens of times – in her statement and in her answers to questions. Despite her claims that is “only an idea”, you would have to be very naïve not to be absolutely sure that this is now her official policy. We suggest that in no-one’s wildest dreams or nightmares, as they went to cast their vote on 23 June 2016, was the prospect that the UK would remain in full subjugation to the EU for 5½ years, in the event of a Leave victory. This is Chequers. This is Remain. This is Theresa May. If this isn’t enough to make MPs overthrow her, what is? Message: May has to attend the 1922 Committee tomorrow (Wed), and that is probably the last chance to save Brexit. But it will need at least one big name such as David Davis to trigger the necessary numbers to topple the evil witch. Without that, they will all just sheepishly fall into line. What I don't understand is why they think they won't pay for this treachery. If May is allowed to continue with her fake Brexit, they will be slaughtered at the next GE, and may never get back into power because the party will be permanently split. The trouble is that with a Marxist government, we will perhaps last 12 months before hyper-inflation sets in, and the Country is irreversibly damaged. Message: Well, yet again rumours of May's demise turn out to be a fake noose. As the fauxconservative party continue support of the EU cabal in the guise of May, do they really think that they are not now regarded with the same visceral contempt as her? Do they really think that they will get supporters back with their obvious contempt for the people and democracy? Even the genuine stalwarts of leaving the EU will not be immune from the backlash against a party making, as we have seen time and time again, the decision to LEAVE the EU rendered meaningless by these braindead sycophants of the glorious fourth reich. I suppose that the destruction of the party is a small price to pay for the projekt. The other side are just as corrupt. It's just that they are not in power. There is something deeply corrupt in the heart of our Parliament. I watched the usual groundhog day proceedings yesterday. The arguments for remain and leave have been out there for nearly three years now. Yet, I listened to many self-perceived 'superior' MPs still arguing long-time debunked pre-referendum arguments and project fear. They either have not educated themselves on the subject in three years or are plainly lying. They think that the people won't notice, just as May thinks that we won't notice that she never answered a single question from those trying to ensure that we do leave. My take is that it's lies. One of the con remoaners, demanded information so that they could make an 'informed' decision, yet had preceded her request by quoting (as many NPC MPs did) that '700k' marched on Saturday. The Met police, never knowingly understating figures as their funding relies on it, tweeted that the figure was 130k - though they subsequently deleted the tweet, following orders. Others have calculated the space occupied from photos and calculations range from 130k - 220k, and that was using 5 people per sq metre, which is a bit of a squeeze. Yet the figure was repeatedly trotted out as 'fact' by numerous remoaner MPs, and they expect us to believe that they are capable of independent thought and considered decisions? EU and vested interest puppets is all they are. The referendum was a mandate to MPs. In this, they are delegates not representatives. We voted to LEAVE the EU. I don't want to hear "We can't". I see Rudd has assured the EU, via a tv interview, that any attempt to leave properly will be voted down. A really good negotiating ploy that. Seems like we're going to have to have a civil rebellion to force our will as those elected to serve us certainly are not on our side. I hope they remember that come 5th November. We may be quiet at the moment, watching the shenanigans but that will not last. If the ballot box no longer works as a means to effect change, alternative methods will be sought. I'm as angry as hell. Message: It would be reasonable to suggest that 17.4m+ Brexiteers are angry following the speech given by UK Prime Minister May in the House of Commons on Monday, 22nd October, 2018. I would go further to suggest many remainers were also unhappy with her speech, at least those I've spoken with. Mrs May's body language gave her away before she delivered her speech, and there are no doubts in my mind she was 'uncomfortable' when presenting it to the House. The EU Commission has gone out of it's way to 'punish' the UK for having the audacity to vote Leave even though we've given them hundreds of billions over the years - in my opinion the EU owes the UK? After fighting hard for decades to get our long promised referendum, and winning it, the establishment seem intent on denying this by hook or by crook. I watched Mrs May deliver her speech and I tend to 'read between the lines' (eg: what she did not say is more important)? Mrs May delivered a clever and well scripted speech [probably crafted by a pro-EU civil servant in number ten] aimed to confuse our great nation, and on that point their goal was achieved, except some of us were not convinced. Let us go back in time to when former Prime Minister Cameron announced in January 2013, the country would be given a clear in/out referendum on membership of the EU [commonly known as The Bloomberg Speech] if he was returned to Office in 2015. It would be our decision, said he. The majority of the electorate put it's weight behind Mr Cameron's promise and his conservative party, and he was returned with an overall majority to continue as Prime Minister. To be fair to Mr Cameron, he upheld his promise and The Referendum Act 2015 was born after much Parliamentary debate. Fast forward to Mrs May's speech. It was, quite frankly, 'double-dutch' or gobbledygook, call it what you will. In no sense did I get the feeling Mrs May was working to deliver a clean Brexit to be free of ALL EU structures. As time drifted by, her speeches tended to be of a more pro-EU style, that's to say, akin to putting our competitors first. TO CONCLUDE: If Mrs May stopped dancing to the drumbeat of her unelected peers in Brussels and publicly told them she would no longer run around after them, she would have my respect. If she also made a public announcement telling the EU they have two months maximum or we take steps to revert to WTO terms of trade, she would have my confidence. This will quickly focus the minds of EU businesses who can run to us should they wish to trade. I APPEAL to Prime Minister May to turn the tables on the EU, and if not, to please stand aside for a Brexiteer MP to take over, and accept our thanks for your public service? All I see is delay and surrender of our great country, and putting it bluntly, this is simply not on. Message: In the news today, 'Three Police Officers sacked for their lies'. This was about a single incident where they wrongly claimed a man walked to the police van, when in fact he'd suffered serious injuries so couldn't. For deceit and lying, all three officers were sacked. How many lies has Theresa May told the electorate? How damaging has that been to the whole nation? And will be in the future if left unchallenged! If British police are expected to be truthful, shouldn't this also apply to our Prime Minister? Message: I too watched TM in the House of Commons. IMO a small, but revealing insight into her mind set is in the use of the words 'relationship' and 'partnership'. While we are members of the EU we are in a partnership. Once we are out (the 12th of Never) we will have a relationship with the EU. TM litters her speeches with these words, as though the meaning is one and the same. The smoke and mirrors approach is also used with 'ideas' and the even vaguer 'ideas have emerged'. Whose 'ideas'? We are moving from a WTO scenario to a WTF? Our politicians agree with the EU. They are incapable of making decisions, so let 27 other countries (at the moment) do it for them. Brexit is now also, the battle for democracy. Message: PM May refuses to fulfil the Conservative Party promises to the electorate: those who voted Leave in the Referendum and those who voted for her in the last General Election. We are still ruled by the principles of Democracy and, as such, shall be protected from such infamy. Theresa May and her close cohorts are TRAITORS to this Nation. She HAS to be removed from post forthwith, if we as a Country are to survive her treachery. Out, OUT, OUT!! Theresa May’s new plan is to keep the UK in the EU until the end of 2021. (See article above.) Apart from failing to deliver control of our democracy, our borders, our trade, and almost everything else, what about the financial implications? The EU has a 7-year budget known as the Multi-annual Financial Framework, or MFF. The current MFF ends on 31 December 2020. This is also the date on which Theresa May had supposedly been planning to take the UK out of the EU, being the end of the agreed ‘Transition Period’. Note: Theresa May continues to refer to 29 March next year as being the date of leaving the EU, but this is not true in practice. The UK will continue to be subject to all EU laws and demands until 31 Dec 2020, under the PM’s existing Chequers plans. On 01 January 2021 the EU’s new 7-year MFF starts. Theresa May’s new plan to extend the ‘Transition Period’ into 2021 automatically means that this new EU budget will apply to the UK. 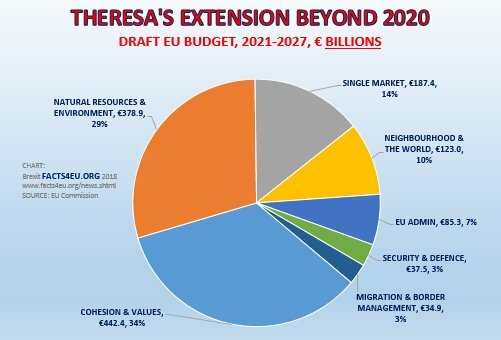 Whilst this budget has not yet finally been agreed in Brussels, it exists and Brexit Facts4EU.Org has reported on its proposals several times. We did so to show Remainers what they would have been facing, and because we didn’t believe it was truly the intention of this Prime Minister to deliver Brexit. 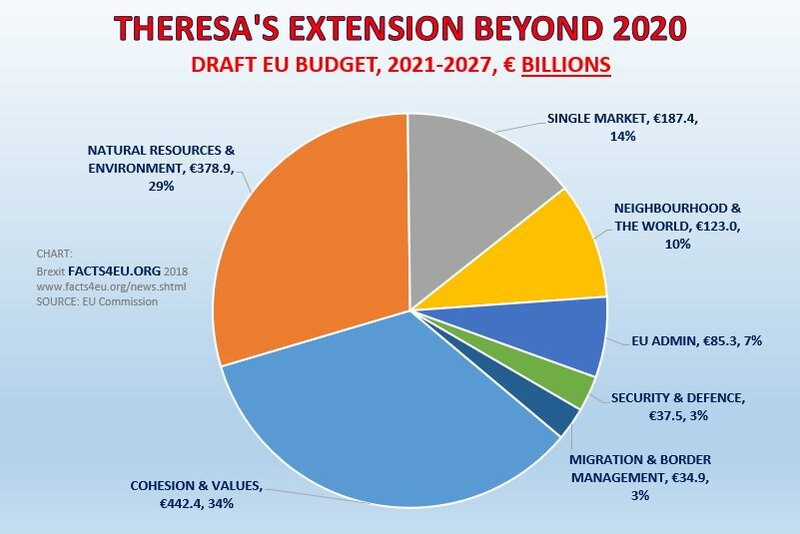 Below is our new overview of how the unelected EU Commission plans to spend almost €1.3 thousand billion Euros (GBP: over £1.1 thousand billion Pounds) of the taxpayer money of EU citizens. Under Theresa May’s new proposals the UK will be liable for its share of this for 2021. Our analysis differs only slightly from the EU Commission’s version. To 'Security & Defence' we have added the €10 billion ‘off-the-books’ defence fund, which will be under the control of the EU’s ex-communist Defence and Foreign Secretary, assuming she retains her position. This does NOT appear as part of the official EU budget, but naturally it should. Probably the key point to make in the current climate, where anti-Brexit, anti-democratic MPs are constantly talking about ‘democracy’ and a ‘meaningful vote’, is that none of these elected British individuals will have a say on the EU’s budget. This budget has been drawn up by the unelected EU Commission. The process of getting this through the various approvals it needs in Brussels will be managed by these bureaucrats. The draft budget will require sign-off by the EU Council and by the EU Parliament, but in the latter case this is like asking the arch-federalist UK LibDems for their approval. The EU parliament is populated by zealots, as Mrs May will find out if she is still in power when and if the Withdrawal Agreement ever comes before them for their (required) approval. We would like to ask Remainer MPs if they are happy that over £1.1 TRILLION pounds of expenditure by the EU will be decided without any involvement from them. This has been going on for decades, do they know this? JUST HOW EXPENSIVE IS THERESA MAY? We deal in facts. We can’t say for certain that Theresa May will extend the ‘Transition Period’ if she is left in power. However her track record to date suggest that this is inevitable, based on her testimony to Parliament yesterday. We also know that the draft EU budget will be amended based on reactions to it so far, and based on the unexpected bonus of more money from the UK. However it won’t change much in terms of priorities for where to spend money. What you see above will more or less represent the priorities of the EU Commission in its headlong drive towards a superstate: the United States of Europe. over this enormous £1.1 TRILLION EU budget. if they don’t oust this incompetent Prime Minister. Message: If Theresa is so much in the mood to give away our money, I suggest that first she hands over 50% of her own personal wealth (money, shares, properties, goods etc - everything she owns) to the EU just to get a little taste of how we feel about what she's doing. A major report has been released today, which represents a further closing of the casket of Theresa May’s and Olly Robbins’ Chequers plan. In another ‘crunch week’ for the Prime Minister, it delivers an additional and sombre blow to her entire Brexit strategy. Last night Brexit Facts4EU.Org received an early copy of the 24-page report and below we summarise its findings. This work by the respected Global Britain organisation outlines why the Single Market has held the UK back and how the UK will be better off out of it. It also hammers home why the Prime Minister must “chuck Chequers”. “This paper shatters the illusion that Single Market membership has been an irreplaceable boon to British manufacturing. NOTE: This is a Pro-Brexit Facts4EU.Org summary of a 24-page report from Global Britain. 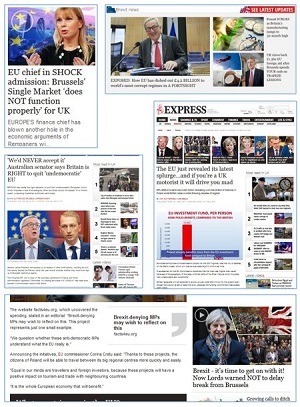 Two weeks ago Brexit Facts4EU.Org talked to Global Britain and on Saturday we were delighted to welcome them as the 14th pro-Brexit organisation to back our ‘Brexit Battle Pack’. Whilst we might differ in style and in the audiences we reach, they value proper research and facts as we do. Their report today clearly shows this. It is a serious piece of work. The Global Britain report contains many of the facts we have published over the past two years, but goes into more depth in many areas. It also presents the arguments in an interesting way. Readers who have come to value the integrity of our work will be encouraged to see that Global Britain’s research and analysis has produced many of the same facts and draws the same conclusions. We thoroughly recommend their report, which you can download in full here. 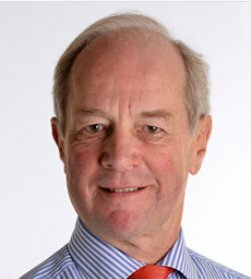 THE POLITICAL BACKDROP – CHUCK CHEQUERS, TRASH THERESA? Today we see the start of yet another ‘crunch week’ for the Prime Minister. She will make a statement in the Commons later, giving details of her partial attendance at the EU summit last week. It seems likely she will be given a tough ride by MPs. Only a few weeks ago she was able to survive the Conservative party conference only by avoiding the use of the word “Chequers” when talking about her Brexit strategy to the party members. We were simply appalled she was allowed to get away with this. Last week she went to Brussels, still presenting her (or rather, the unelected Olly Robbins’) Chequers plan. Had she admitted to the Conservative party members that she was going to do this, we think it likely that she would have been heckled and booed. We doubt that any Prime Minister could have survived this. Even some of the spineless anti-Brexit MPs would have realised the game was over. On Wednesday the Prime Minister will face another grilling during Prime Minister’s Questions, and it has been reported that her presence has been requested at the meeting of the 1922 committee that day. Today’s Global Britain report hammers a further nail into the coffin that is Mrs May’s Chequers plan. Whilst the report does not call for the dismissal of the Prime Minister, it rubbishes her proposals so completely and effectively that any Tory MP reading it will wince. We will leave you with some final excerpts from the excellent Global Britain report, written by Ewen Stewart and Brian Monteith. 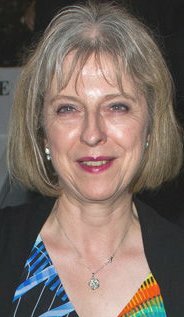 Message: [Off topic] I now view Theresa May with utter contempt and am absolutely DESPERATE to get rid of this woman. Sick to to the pit of my stomach with her mendacious treachery and the complete annihilation of the Brexit we fought so hard for! Incandescent with rage at her suggestion that we extend the transition period - was vehemently opposed to a transition period in the first place! Message: I have tried so far as I can to be courteous to UK Prime Minister May, but I feel that as a passionate Leave voter and democrat, I must now ask Mrs May to do the decent thing and stand aside to be replaced by a Brexiteer MP. This does not require a general election. Mrs May is a remainer, pure and simple, and her negotiations have been the worst I've seen in my life, and I'm getting on a little! Why Mrs May fails to understand we voted to "Leave the European Union", and this means ALL EU structures, is anyone's guess. Just what part of Leave does Mrs May not understand? Ignore the snowflakes who would prefer our country to be governed by unelected, unaccountable, and overpaid bureaucrats in Brussels. Mrs May has from what we've seen been trashed by the EU Commission, and in turn they trash our country, meaning they trash British citizens. I among many will NEVER again vote Conservative, nor will I vote Labour. I look at our Houses of Parliament in disgust, and view those MPs and peers who go against our democratic vote in June 2016 as nothing less than anti-democratic, which is probably an understatement. More to the point, they have total contempt for the electorate, yet they forget Parliament handed the decision to the electorate. They didn't like the outcome, so what, that's democracy, yet all that happened is the people have taken back what MPs gave away without consent. This is why it's become them versus us - the political class versus the people - the establishment versus the people. Anything less than a CLEAN BREAK is not good enough. We have some good MPs and peers, and those who recognise a democratic result when they see it. Unfortunately, they too must realise that by allowing Mrs May to continue, they are tarred with the same brush. I feel certain I am one of the 17.4m+ Leave voters who may treat those MPs who ignore our vote, with the same contempt they show the British people. Message: The argument for the Single Market destroyed. Bravo! It's time for Remain to have the humility to accept that they are wrong, on one of the central arguments for remaining in the EU. As a Leaver I acknowledge that I too have been wrong. I believed the politicians would deliver the Brexit we voted for on 23d June 2016. For that, I apologise. Message: More and more it looks like that it's obvious to everyone that Chequers is a complete nonsense, nobody wants it and will never work. By everybody I mean everybody except Theresa May of course. Seriously, get rid of her now! The ECJ used Twitter on Friday to instruct Poland to suspend one of its laws immediately and retrospectively. It did so in English and Polish. 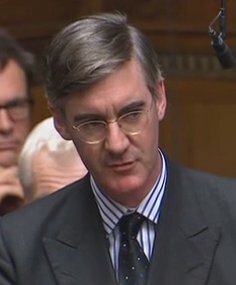 In what must be one of the starkest demonstrations yet that member countries of the European Union are already “vassal states” - to use the words of Jacob Rees-Mogg MP - on Friday the unelected EU Commission used the ECJ to tell the Polish government to change its laws. The ECJ (more formally the Court of Justice of the European Union) delivered its decision on Twitter, before its full judgement had even been published, coming as a shock to the elected Eurosceptic government in Poland. The instruction to the Polish government by unelected EU judges, instigated by unelected EU Commissioners, to suspend one of its laws immediately and retrospectively, demonstrates how much power the EU has quietly accrued. This is an immediate instruction and the ECJ will deliver a further judgement and instruction in due course. WHAT’S THIS LAW ALL ABOUT? In April in Poland a new law came into force, requiring its Supreme Court judges to retire at the age of 65 or to request that they continue to serve after this age. Some Polish Supreme Court judges complained to the EU. The unelected EU Commission supported the Polish judges and opposed this measure. Last month the Commission sought to have it overturned by the EU’s own judges sitting in tiny Luxembourg. On Friday, these ECJ judges backed their fellow judges in Poland. This judgement came just 48 hours before the Polish local elections which are taking place today, which has raised serious questions regarding what might be seen as overt interference by unelected EU judges in the internal politics of another country. Four days before Christmas last year, the EU Commission ‘went nuclear’ on Poland, triggering Article 7 of the EU Treaty. This is the first time that this treaty provision has been used by the EU. Article 7 allows the EU to strip a member country of its voting rights and ultimately to stop its payments from the EU. Poland is by far the biggest recipient of ‘EU’ funds in the EU28. The EU Commission is fighting the democratically-elected and Eurosceptic government in Poland, which won power in the elections of 2015. The Law and Justice party (PiS) of Mateusz Morawiecki won 51% of the 460 parliamentary seats, securing the first overall majority since Poland became a democratic country after the fall of the Soviet Union. The Polish government is in conflict with the unelected EU Commission bureaucrats over its opposition to the EU’s migrant policies in particular. Poland refuses to accept the imposition of quotas of migrants by the EU, arguing that it alone should decide who it lets in. This article is about national sovereignty in the EU – or lack thereof. The precise details of the Polish law which has been overturned – the setting of a retirement age for Supreme Court judges – need not concern us here. There is a background to this which is not understood at all by the vast majority of the British media, but now is not the time. Just 48 hours before the highly significant local elections taking place in Poland today, the EU’s judges sitting in Luxembourg appear to have rushed out a decision, instructing the elected government in Poland to rescind its law in April, and to backdate the changes. Naturally this has been widely reported in Poland, where any declining vote for the ruling PiS party will be seen by the Commission as a victory for the EU’s tough actions against the Eurosceptic government there. Today’s elections cover three tiers of Polish local government: municipal (gmina), county (powiat) and provincial (województwo). These have considerable influence over how the billions of pounds with which the UK taxpayer has been subsidising Polish infrastructure development since 2004 are spent. This funding is of course always described as ‘EU funding’ in Poland. We wonder if any of the “Losers’ Vote” marchers in London yesterday have the remotest idea about any of this? Are they aware of the massive wealth transference of £’s billions that has taken place from the UK to countries such as Poland, as a result of our EU membership? Are they aware that under EU rule there is no effective national sovereignty in member countries? Do they realise that what has just happened to Poland is simply the EU using the powers it has built up, without the ‘people’ having been aware of it, and with nothing they can do about it? Can they imagine a policy they believe passionately in – let’s say the prevention of cruelty to teddy bears – being torn up by an unelected EU Commission aided by unelected judges in Luxembourg? Do they even know anything about Luxembourg where the ECJ is based – the fact that the entire country only has the population the size of Sheffield, and that its most famous export is named Jean-Claude Juncker? Please, please, please, if you want to see your vote respected, act today. Read the Brexit Battle Pack. Take one action. Just one. Then do another one next week. Then another. Pile on the pressure. Message: In my opinion, if there was ever a time for Poland (and other EU members) to exit the European Union, that time is now, and if there was ever a time to wholly ignore the ECJ [whatever it takes] that time has come and is long overdue. Without doubts, this is interference by foreign structures in the national affairs of another country. I view this as another power grab over an entire country and its citizens on an industrial scale, by unelected, unaccountable bureaucrats in Brussels using questionable legal methods. Poland is entitled to assert its own authority in its own national interests? The good people of Poland should realise what they were once tied to decades ago, has resurfaced in the guise of the EU. Now more than ever before, we in the UK can see how correct we were in voting to "Leave the European Union". To be free of the lunatics who believe they can walk all over countries when they feel like it. To be free of their constant bullying and threats - and the EU claims it is friendly! When the Polish electorate next go to vote in a so-called democratic election, they should ask themselves WHY they are bothering to vote in the first place when an external court has ordered their country to suspend some of their own national legislation? No longer is this a trading arrangement as we were led to believe decades ago, but in taking small steps to a federal Europe and loss of national identity and culture. Polish people must themselves choose their future destination - and I suggest they do not wait too long. They either want to be a free people, or be subservient to unelected, unaccountable bureaucrats in Brussels? We will be launching our new BREXIT INDEX in early November. This will give you quick and easy access to all the excellent daily reports we have been publishing since before the Referendum campaign started. There is more information on this here.